9th Sept. This would have been the Mail day for England but no Steamer is sent from the Fleet, so I continue this scrawl. Page 2 11th September continued. So much for my chance of Promotion, of which you can judge nearly as well as myself – without being sanguine it is far from being improbable and the reply was more gracious than I expected. I think if we, that is the Army take Sevastopol, my Lords would scarcely refuse it & what a difference will it make to me!! We hear we were delayed at Anchor, while Sir E Lyons in the Agamemnon 16 & Lord Raglan in the Caradoc 17 went to reconnoitre the place for Landing the Troops some 7 miles N of Sevastopol they returned to the Fleet at 6 A.M. I suppose they then had a Council until ½ past 11 when the Signal to Weigh Anchor & proceed was made At noon we are under Weigh & taking up the two ships we have in tow – I shall send with this a plan of the order of the Fleets Sailing 18 given to me by Captain Mends R.N. 19 Flag Captain to Sir E Lyons 20 in the Agamemnon 21 – Sir E. L. has the whole of the executive duties of the Naval position of the Expedition & I believe Sir G. Brown 22 of the Army. Admiral Dundas 23 & Lord Raglan are I believe myths or like the Great Llama more Supposititions [sic] than real & only in the event of Success to be found & Crowned with laurels – When our anchor came up it was covered with Sea weed & muscle shells – I took some to dry & keep as a curiosity – “A Specimen of Seaweed from the rendezvous before the taking of Sevastopol”!! if we are successful & why should we doubt it, it will be invaluable – 12th Sept. Kept on quietly all night this morning we are in Kalamita Bay about 10 miles South of Point Eupatoria the Southern part of Promontory of which Cape Tarkan is the most prominent feature Lol 24 may be able to find our place out on a good map. At 11 All the Fleet stopped apparently for Stragglers to close & take their places in the line – Mr. Filder’s asthma very bad, he was coughing nearly all night, independent of all other reasons he is too old & too feeble for this duty & service. 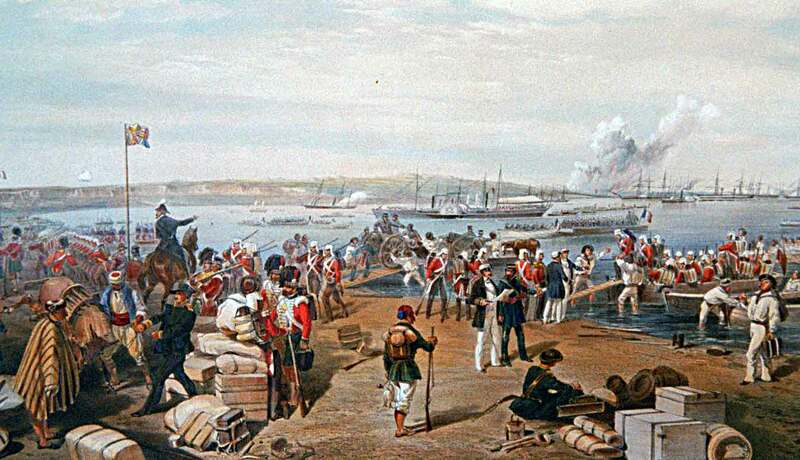 The landing at Kalamita Bay, 14 September 1854, by William Simpson. at http://www.xenophon-mil.org/crimea/war/simpson/simp29a.htm, accessed 9 May 2015.